Salvia are some of the showiest plants for containers and mixed borders, and are members of the mint family, making them vigorous growers but hardly ever aggressive like the culinary form. The flowers are made up of two lips, the upper one forms a hood and the lower is wide and toothed. Woody summer flowering salvias are derived from two species, Salvia microphylla and Salvia gregii. They are sun loving plants from high altitudes so good drainage is essential for survival. There are several types of Salvia, some are totally hardy some are very tender and some are half hardy. 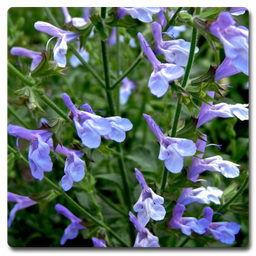 It is important to know which type of Salvia you have or are buying. The flowers on most Salvia are long lasting and attractive to wild life. It is important to keep them well watered and mulched for the winter months. Pinch out the top 5cm or so of the young plants new growth after planting to encourage better branching. It is wise to feed the plants, especially if grown in pots, every month. They mostly need full sun and extremely well drained soil. There are a few which will take some shade, for example, Salvia bulleyana which will in fact grow in shade. Salvia nemerosa types are hardy and flower usually from May to the first frosts. They will then lose all their foliage for the winter and reappear in the spring. Salvia with woody growth. It is advisable not to trim back the top growth until spring. Do not cut back hard into the old stems as the plant will probably not recover. The more tender varieties like S elegans are best protected over the winter preferably in a greehouse. Most gardeners associate Salvia with full sun but there are a large number of them that thrive in partial shade, and some even tolerate full shade. There are of course several degrees of shade, and a spot in the garden that doesn't get sun all day is referred to as deep shade. Few Salvia do well in these conditions. Partial shade, or dappled shade or indeed morning or afternoon shade is much more suitable for them. Salvia dombeyi for instance will grow in all but the deepest shade and has wonderful crimson flowers with burgundy bracts, and will bloom from summer until autumn. Another wonderful one for the shady spot is S. bulleyana and great combination of yellow and purple flowers. Again flowers into autumn. Salvia caclifolia will grow well in partial shade, or morning/afternoon shade. The deep azure flowers are wonderful and look well planted at the edge of a woodland. It will take more moisture than most. Salvia 'Wendy's Wish' will take partial shade and is a wonderful addition to any garden or container. They really are wonderful plants are give you so much colour during the summer months it is worth giving them that extra bit of love..